The pipeline to Europe would compete with Russian gas networks. Upwards of a thousand dignitaries – including the presidents of Turkey, Georgia, Azerbaijan, Ukraine, and Serbia – assembled June 12 at a barren site outside the northwestern Turkish city of Eskişehir to take part in a new Turkish tradition: the glitzy infrastructure commissioning ceremony. The occasion was the inauguration of the first phase of the Trans Anatolian Gas Pipeline (TANAP), designed to carry gas from Azerbaijan via Turkey to Europe. The pipeline's construction is now almost complete, but questions remain about its prospects. First announced in November 2011 by Azerbaijan's state oil company, SOCAR, TANAP is being developed by a consortium led by SOCAR, with junior partners the Turkish state gas company BOTAŞ and British giant BP. It is designed to realize the European Union's long-stated plan of creating a “Southern Gas Corridor” to compete with Russian gas, which currently accounts for the bulk of imports into the EU. While other pipeline projects designed with the same aim have failed to get off the ground, TANAP has succeeded in forging a commercial link between the consortium developing Azerbaijan's Shah Deniz gas field on the one hand and gas buyers in Europe on the other. With the first phase now complete, gas is scheduled to start flowing to Turkey at the end of June. The ceremony was timed to get ahead of Turkish elections on June 24, which have turned into an unexpectedly tight contest for Turkish President Recep Tayyip Erdoğan, who is seeking to maintain control of the Turkish parliament as well as his own office. The election added drama to the proceedings, with martial music and giant high-tech video projections preceding speeches by Erdoğan, Azerbaijani President Ilham Aliyev and the presidents of Serbia and Ukraine, in a ceremony clearly designed for TV audiences across Turkey. Blatant electioneering was kept to a minimum, however, and speakers focused more on the significance of the close relations between Turkey and its neighbor Azerbaijan as well as the significance of TANAP itself. “TANAP has been realized through the strong, joint political will of Turkey and Azerbaijan. It was a major challenge, both financially and technically, but we did it," Aliyev said. Erdoğan went further: “When TANAP was first announced, some said it was a dream and could never be realized, but we were patient and proved them wrong,” he said. At 1,850-kilometers long and costing around $11 billion, few would argue that constructing TANAP is anything other than a major achievement, not least because it forms the main component of the EU’s 3,500-kilometer Southern Gas Corridor. But while gas can now be shipped from Azerbaijan's Caspian Sea to northwestern Turkey, much must be done before the entire corridor is complete. As it stands, the completed section of TANAP can carry 31 billion cubic meters (bcm) a year of gas but has commitments of only half that, about 16 bcm, and in its current phase can supply only up to 6 bcm a year of gas to Turkey, where it will find a ready market. The remaining 10 bcm of committed gas is to be transited to the Turkey-Greece border where it will be transferred to a second pipeline, the 20 bcm Trans Adriatic Pipeline which is slated to carry the gas through Greece and Albania and across the Adriatic to Italy, where existing infrastructure can carry it to European markets, starting in the middle of 2019. 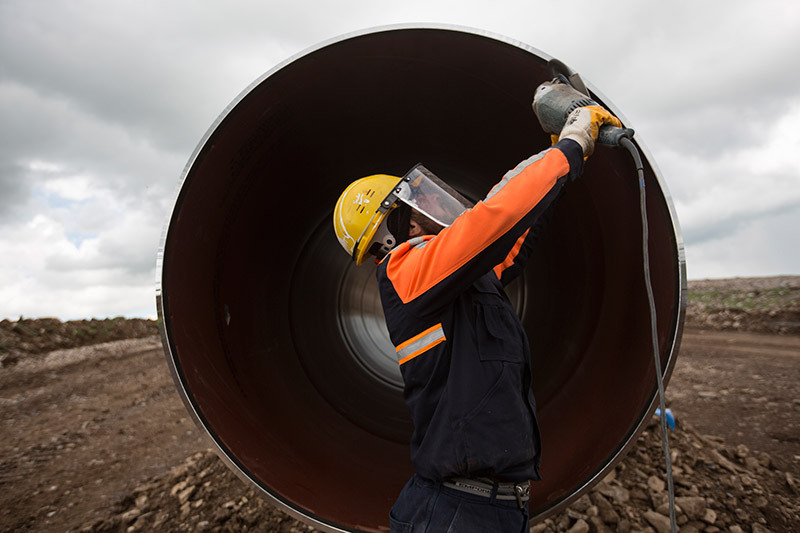 The final section of TANAP running to the Turkey-Greece border is scheduled to be completed as planned, but the Trans Adriatic Pipeline has run into problems. Construction was already behind schedule before Italy's newly elected Euroskeptic government last week announced that it saw no reason to support the project and launched a "review." That has raised the specter of construction being canceled, leaving the Southern Gas Corridor incomplete, TANAP without an export route, and Azerbaijan itself without a major source of income from gas sales. "Almost $40 billion has been invested over the past decade in bringing Azeri gas to Europe, and now the project is threatened because the last 108 kilometers of pipeline can't be completed,” said John Roberts, a Caspian gas analyst, though he predicted that ultimately a compromise will likely be found. "A lot of money is riding on the prospect of gas flows into southern Italy and northwards into Europe," noted William Powell, editor in chief of Natural Gas World. Fortunately for Azerbaijan and Turkey, alternatives do exist: Azerbaijani gas could be carried from TANAP to Greece and Bulgaria and on to other markets in southeastern Europe via existing pipelines and planned interconnectors. Hence the appearance of the presidents of Serbia and Ukraine at the commissioning ceremony, heaping pre-election plaudits on Erdoğan, as well as on Aliyev, and confirming their respective interests in importing gas from Azerbaijan via TANAP. "We fully support the creation of new gas transit routes and want to receive gas from TANAP via Bulgaria and Romania," Ukraine President Petro Poroshenko said at the ceremony, pointing to Russia's notorious past use of gas cuts to put political pressure on Kyiv. Those sympathies were echoed by Serbian President Aleksandar Vučić, who confirmed both his admiration for Erdoğan and his country's readiness to take gas from TANAP. In the short term, both may face disappointment with the Trans Adriatic Pipeline issue likely to be resolved and gas flows to Italy started, if not on time, then without major delays. Over the longer term, though, TANAP still has nearly half its capacity unallocated, which Azerbaijan hopes to fill with gas expected from new Caspian fields now under development. That gas is projected to come online within five years: just in time for the next Turkish elections. David O’Byrne is an Istanbul-based journalist who covers energy.